Do not fret if you run out of cash while you are here. 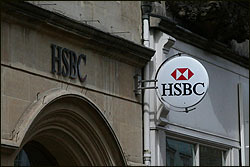 Most major British banks have a presence in central Oxford with branches on Cornmarket Street or High Street. However, there are no cash machines (ATM) in the University Science Area or publicly accessible regions of Oxford Colleges. Cornmarket Street: At least 3 major banks - HSBCB, Barclays, NatWest - have a branch here with cash machines outside. High Street: There is a NatWest branch and ATM at the corner of High Street and Alfred Street. Turl Street: Just off Broad Street, Barclays have ATMs here. George Street: There are NatWest and Alliance & Leicester bank ATMs on George Street at the corner of George Street and Cornmarket Street.